37.5mm 18K white gold case, onyx cabochon crown, 18K white gold bezel set with 60 brilliant-cut diamonds. (~1.09 carats), black dial with whirling titanium comet motif, 31 brilliant-cut diamonds, self-winding movement with hours, minutes, approximately 42 hours of power reserve, black satin strap, ardillon buckle in white gold. 37.5mm 18K white gold case, onyx cabochon crown, 18K white gold bezel set with 60 brilliant-cut diamonds. 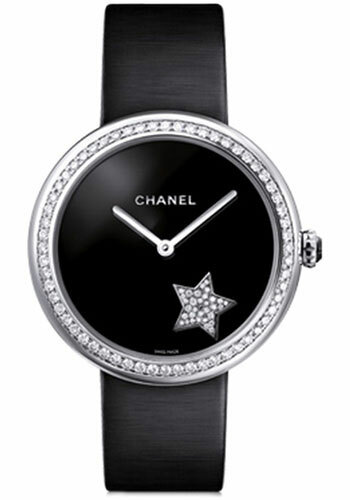 (~1.09 carats), black dial with whirling titanium camellia motif, white and black brilliant-cut diamonds, self-winding movement with chanel 12-ws movement, approximately 42 hours of power reserve, black satin strap, ardillon buckle in white gold. 37.5mm 18K white gold case, onyx cabochon crown, 18K white gold bezel set with 60 brilliant-cut diamonds. (approx. 1.09 carats), blue dial with sapphire crystal ring set with 12 brilliant-cut diamond indicators (approx 0.09 carats), self-winding movement with slightly cambered minute dial in aventurine glass, hour hand is represented by a man in the moon motif, minute hand is represented by a comet, approximately 42 hours of power reserve, satin strap, ardillon buckle in 80 brilliant cut diamonds (approx 0.48 carats).